THE Mallorca diver who survived 60 hours trapped 120 ft below the sea said he felt ‘buried alive’. 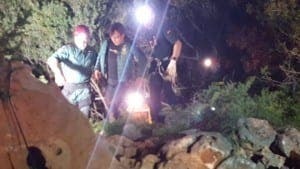 Xisco Garcia, 54, vanished while out diving in Sa Piqueta, near Manacor, after becoming entombed 900 metres from the entrance of the labyrinthine cave. Trapped in a tiny cavity with no oxygen in his tank, he was unable to swim back to the surface, and had only a tiny puddle of water to drink. “Of all the deaths a scuba diver can suffer, mine would have been the worst,” he said, speaking for the first time since the ordeal. A team of 60 rescuers spent days looking for Garcia, who became separated from his diving partner when their safety line snapped. His diving partner Guillem Mascaró was able to guide divers to the spot where he last saw Garcia. Several previous attempts had to be abandoned due with poor water visibility.